Two holidays = A short week for bento boxes! Bentos for the week: Since our week was so celebratory (Labor Day & Rosh Hashanah) we have just three Bentos to share with you. This was Tuesday’s lunch. 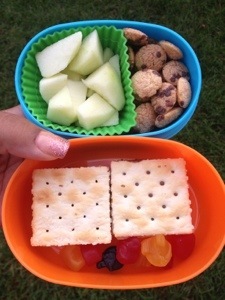 Nutella crackers, apple chunks, Cookie Crisp cereal and fruit snacks. This was our Lizard Lunch. 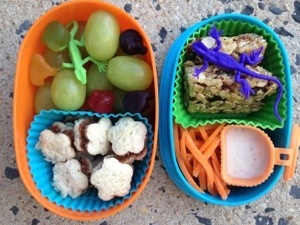 Granola bar, Nutella sandwiches, grapes, carrot matchsticks with ranch and fruit snacks. 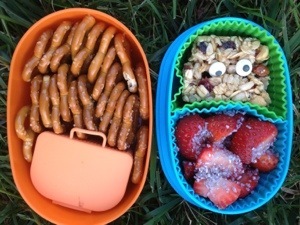 Last but not least, pretzels with Nutella for dipping, strawberries with silver sprinkles and granola with candy eyes! What did you pack this week? Previous Post What us people pleasers need in this life! Next Post A list for recovering people pleasers. I love the lunches you have shown here I too pack mine and my hubsnads lunches daily and now my youngest son is trying to save money I pack his too. I love your idea of using the cupcake papers. This is great.thank you for sharing.